Restaurant kitchens used to be cramped, windowless hellholes invisible to the dining public. 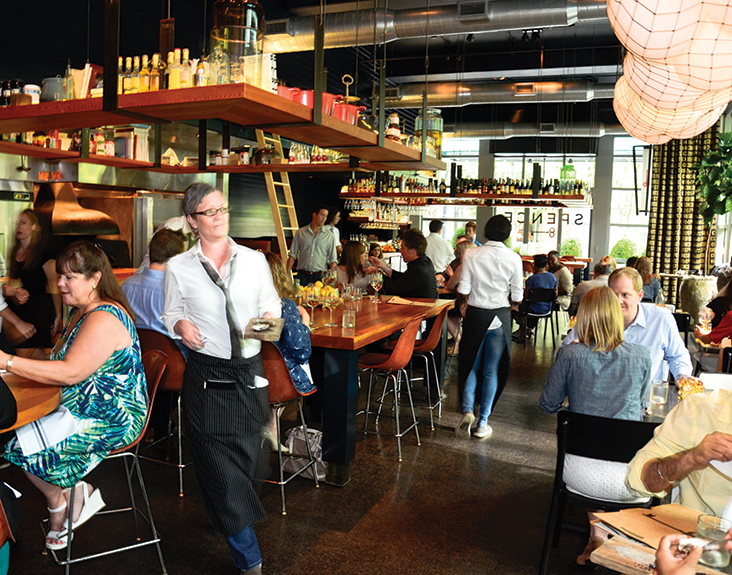 That changed in the early nineties when restaurants like Azalea and Canoe ushered in a new era of luxurious open kitchens, where cooks moved gracefully under the spotlight before a hungry audience. Now the cooks have moved into the dining room—literally. Breaking down the fourth wall between chef and customer, these restaurants represent the newest movement in kitchen design. In turn, kitchen stars now face their guests, who hope for hospitality as first-rate as their meals. 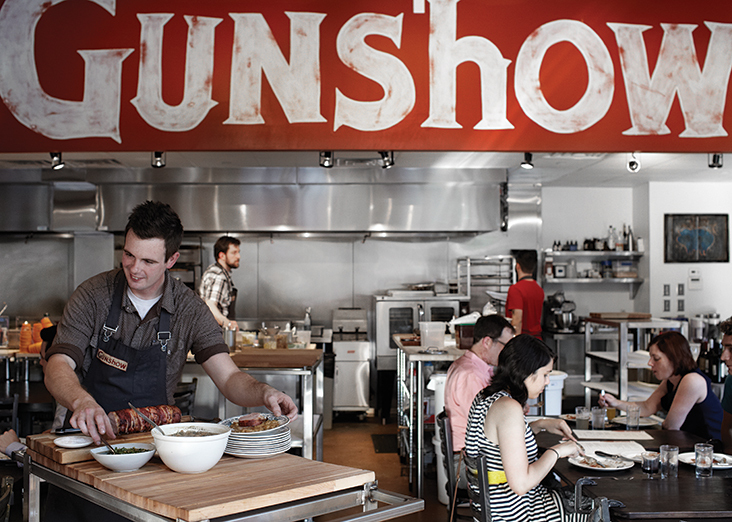 Last spring Top Chef alum Kevin Gillespie opened Gunshow, which blurs the lines between kitchen and dining room unlike any other. 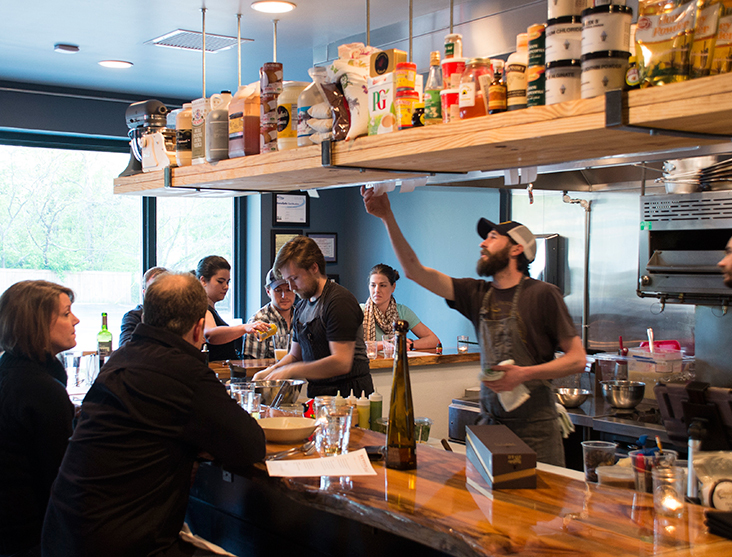 Chefs deliver their works on carts, assembling plates and carving meats tableside. Their own best advocates, chefs don’t take rejection easily; decline a dish, and they’ll probably convince you otherwise. Designed more like a television studio, the Spence’s kitchen is a fitting setup for a concept built around celebrity chef Richard Blais. From a square high-top table, feel the flames off the hulking wood-fired grill as servers slip behind you to grab orders from the counter. 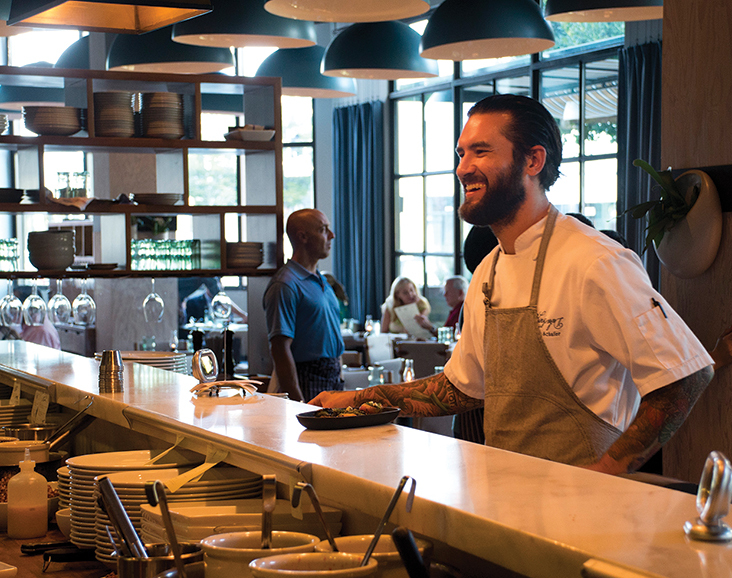 Kitchen chatter is kept to a minimum, but chefs say that their conversations tend to carry to the restrooms. Cutting boards Glowing coals, burning logs of wood, and a massive hearth heat Ford Fry’s medieval kitchen at King Duke. From a seat at the chef’s counter, watch the sweat beading down faces as the grills burn at 700 degrees Fahrenheit. Just over a marble ledge sits a spread of garnishes, while two arms away, executive chef Joe Schafer and his servers expedite orders.